You’ve heard Granddad talking about these little beauties, but you’ve never actually seen one because he sold his cherished Snapper! collection and retired to Islamorada on the proceeds! 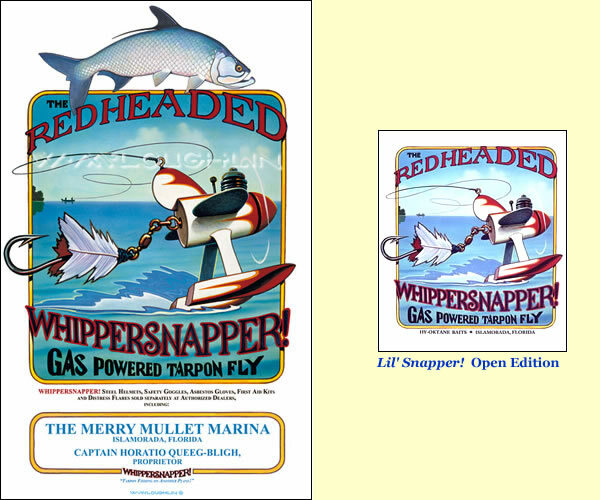 Luckily, renowned inventor Wayne McLoughlin, creator of the first gas powered fly for those unable to double haul an eleven weight line, has released a poster commemorating the first “flight” of the original Whippersnapper! on April 24, 1944. You can customize it with the weight of your best tarpon, your marina, your guide and your gear. Hang on to this treasure a couple of decades, and you too will be able to retire to the Keys! Fill our your form, send in your order and you will receive a proof for spelling, style and layout by fax or e-mail.